www.investing101.ca: Well, whatta ya know ..
Back in 1977, Warren Buffett told shareholders in Berkshire Hathaway that the company would only invest in a business that the directors could understand. You can use this philosophy in your investments just like me. When not investing, I find time to run the Pizza Lunch at my child's elementary school. Its a great way to raise funds for the school's discretionary programs and to give back to my community. It also brings home the relative simplicity of the pizza business! 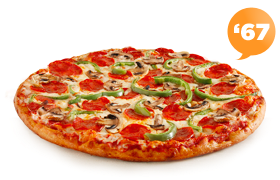 Since 1967, Pizza Pizza has been making this classic super pizza (see pic) and delivering it around southern Ontario. The chain is no pervasive in the region that Canadian Border Security had been known to ask returning residents if they could repeat Pizza Pizza's phone number to prove their residency ("It's nine-six-seven-eleven-eleven officer"). - Over the past ten years, same store sales growth has averaged 4%. - The dividend sits at 7.16 % and a 4.2% increase has just been announced (eligible dividend for tax credits). - The new corporation works much the same way as the income fund and receives a 6% royalty on sales at Pizza Pizza restaurants and a 9% on sales of Pizza 73 restaurants (simple structure). - The menu is being updated and expanded based on health considerations (Heart Smart, gluten free, thin crust/lower carbs, etc. ), and demographics (in the GTA this means Halal meat products). Keeps me coming back for more!